This error seems like an artificial restriction made by Apple, perhaps Apple wants us to separate out the static table view controller to make it look tidier. As the error mentioned 'only valid when embedded in', we can use a container view to resolve this. 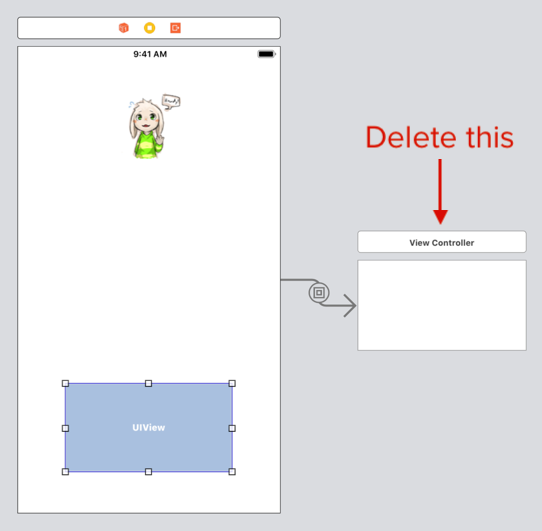 First, remove the static table view from the view controller. Then drag a container view to the view controller. After placing the container view, a new view controller will be created and linked automatically, this is the view controller that controls the contained view. This is also called as embed view, which is mentioned in the error message earlier. 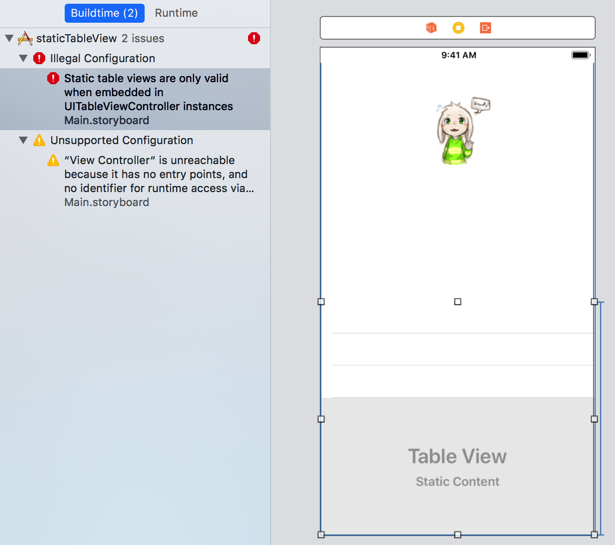 As static table view only works on Table view controller, we will proceed to delete the newly created view controller and then drag a Table view controller to the storyboard. 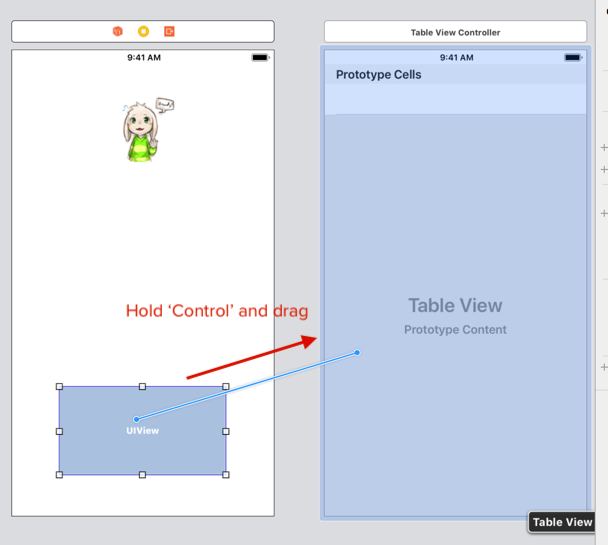 After placing the Table view controller, select the container view (the small UIView), hold control and drag it to the Table view controller, then select Embed. Most of the time you would want the parent view controller (which have the container view) to perform an action say, segue to another view controller , when a row inside the embedded table view is tapped. How do we notify the view controller that the embedded table view row is tapped? There's many way to do this, one of the way to do it is by using delegate pattern. In the table view controller, add a delegate variable which conforms to the TableViewControllerDelegate protocol, and the protocol contain some function you want to use to notify the parent view controller. weak var delegate : ProfileTableViewControllerDelegate? And in the parent view controller, we can access the table view controller by using self.children property. self.children will return an array of container view / embedded view controllers from the parent view controller. Since there is only one container view / embedded view controller (the table view controller), we can assure that self.children will be that table view controller. Not sure how delegate works? Check out the explanation here.